Play along with wireless audio from your Bluetooth device! The versatile TransActive Drummer Wireless is excellent as a stage amp, monitor, or practice amp. Recessed handles allow for easy transport, and the metal grille provides added protection. The angled front of the TransActive Drummer Wireless offers the correct monitoring position for the seated drummer. Nearly all connections are made on the back panel, keeping the top-mounted controls clean and clutter free for quick access during performance or practice. In addition to the Main and Aux inputs, the TransActive Drummer Wireless allows stereo reception from any Bluetooth equipped device. This unique addition is a powerful practice aid for any drummer. Download rudiments and lessons to your Bluetooth device, or improve your skills by playing along to your favorite tracks. A dedicated volume knob is provided on the top panel. 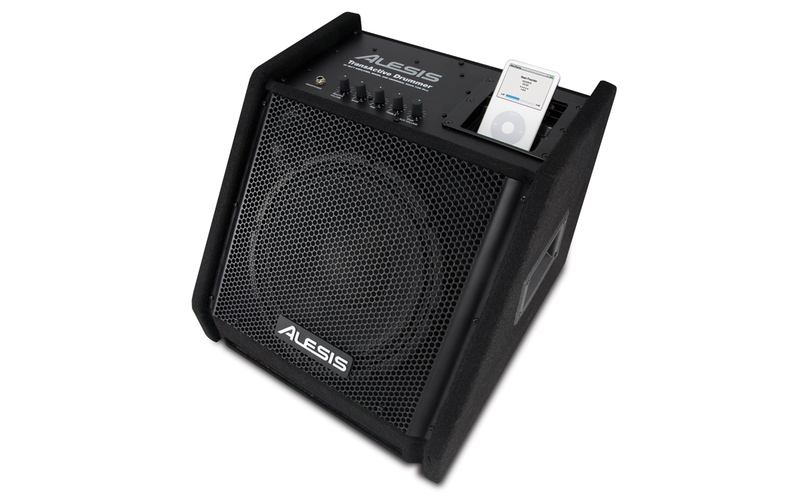 The TransActive Drummer Wireless provides 100 Watts of power. Sound is delivered through a 10" low-frequency driver, assisted by a 1" tweeter. Together, these components handle the rapid transients created by an electronic drum set. The top panel controls are easily accessible during performance. Bass, middle and treble controls provide detailed sound shaping, and the master volume lets you keep your level in check. The rear-panel offer main left and right 1/4" inputs, plus a pair of stereo aux inputs featuring RCA jacks for use with a sampler, mixer, or other audio equipment. The Stereo Link system allows two TransActive Drummer Wireless amps to be used together in a stereo configuration. The main left and right outputs are also fitted with 1/4" jacks, and allow for connection to a PA system or even a recording interface. Up top is a convenient headphone jack that mutes the speakers for private playing. The handy 5V / 1A USB charging port allows users to keep their device charged while in use.